It was the day I got yelled at for riding on top of the car. The police chief’s secretary had seen me yesterday and wasn’t 100% sure it was me. She brought the police chief in to talk to me and I was scared shitless, thinking he was going to deport me for it. He said “I don’t want to be scraping up your blood and bones off the street.” Feeling bad, I explained to the secretary that I hope the guys who did it don’t get in trouble because she knows them. Riding in the back of utes is alright, but not on top of cars. The guys who gave me the lift were just trying to help me out; they weren’t trying to get me in trouble. The rest of my travels on this exotic Pacific island were amazing expect for a major cycling accident two days before leaving. It was really hard leaving the island (as it would be to leave any Pacific island). 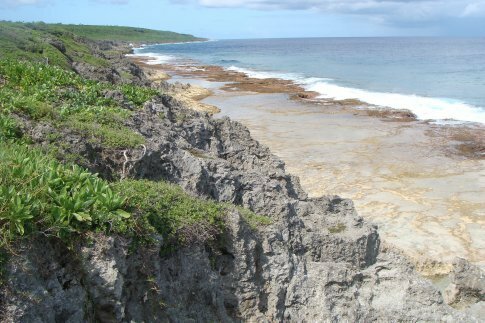 All in all I love Niue! Hi I enjoyed your story.You have a wonderful attitude and spirit to life .I am glad you enjoyed your time on Niue.I am going there my self soon and will be taking my family with me. Oh Chris. Great story though. Love how adventurous you are.